12 July 2012 – The Rolex One to Watch for July 2012 is Brianne Goutal (USA). Currently based out of Cloverleaf Farm LLC in Wellington, Florida, the 23-year-old has jumped from 413th to 226th – a move up the Rolex Rankings of 187 places. Brianne Goutal made history as the first junior rider to win all four major equitation finals: the 2004 United States Equestrian Federation (USEF) Show Jumping Talent Search Finals-East; the 2004 Washington International Equitation Classic Finals; the 2005 USEF/Pessoa Hunter Seat Medal Finals; and the 2005 American Society for the Prevention of Cruelty to Animals (ASPCA) Maclay National Championships. In 2005, when she trained with Frank Madden of Beacon Hill Show Stables, , Brianne experienced a momentous year, and not only in terms of competition wins. At the age of 17, Brianne was awarded the ‘Lionel Guerrand-Hermes’ Trophy, awarded to her by the United States Equestrian Team (USET) Foundation and recognising her as the Junior Rider best identifying the ideals of sportsmanship and horsemanship. In the same year, Brianne was featured on Animal Planet’s TV series: “Horse Power: The road to Maclay”, a major Championship which she won riding the nine-year-old Logan. Further victories include both individual and team gold at the North American Young Riders’ Championship and the USEF National Junior Jumper Championship. In 2006, Brianne went on to win her first Grand Prix with the 10-year-old gelding, Onira, at the Garden State Horse Show, New Jersey. 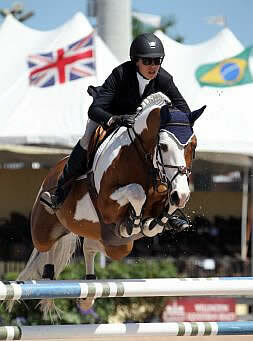 Shortly afterwards, the young American was named ‘2006 Junior Equestrian of the Year’ by USEF. Having been chosen to represent her country at the 2006 Nations Cup in Buenos Aires (ARG), where she helped her team to victory, Brianne was awarded the Maxine Beard Show Jumping Developing Rider Award by the USET Foundation, symbolising her promise to represent the United States in international competition in the future. The following year Brianne rode as part of the United States Developing Rider European Tour and helped her country win Nations Cups in Finland and Sweden. Brianne and Onira were reserve champions in the Smart for Life Grand Prix Class at the CSI2* Winter Equestrian Festival, before going on to represent the United States at the 2007/2008 Rolex FEI World Cup Jumping Final in Gothenburg (SWE). Brianne and her trainer, Conor Swail, continue to produce great results. Last month (June), Brianne claimed victory in the Grand Prix Class at CSI2* San Remo (ITA) aboard Onira, as well as the Grand Prix Class at CSI3* Lons le Saunier (FRA) riding the 11-year-old stallion, Nice de Prissey. Brianne finished third with the 14-year-old mare, Ralvesther, in the Rolex ranking class at CSI3* Canteleu (FRA) and fifth in the Grand Prix. Last weekend, Brianne secured a second and third place in two speed classes at CSI3* La Clusaz (FRA) aboard the 16-year-old gelding, Mon Gamin. Brianne’s plan is to keep showing at Grand Prix level competitions as well as further her international experiences. August’s Rolex One to Watch will be announced at the beginning of August 2012.